This Blog was started from the Origin story I came up with for my Boss Battle Skin Contest #25 entry. If you like it please give Diamonds. That will let me know if it's worth continuing on with the story and travels of the Ghastling. Ages after the EnderDragon was defeated, a lone Ghast wandered from the Nether into the Overworld and eventually found it's way into the End. It was immediately noticed by the Endermen of the realm which began to attack it. In retaliation the Ghast fought a long and fierce battle. However, it was defeated. After its defeat a single Ghast tear fell upon the dormant dragon egg left by the unnamed adventurer that defeated the Dragon long ago. After some time the egg began to rattle and move. Then it burst! From it came a single humanoid Ghast. The Endermen, angered by it's mere presence, set at it as they did it's predecessor. This time however their foe was different. With lightning speed the Ghastling made quick work of many of it's opponents. Using fierce melee attacks and fireballs it shredded through one Enderman after another. It was enough though, Endermen started to appear en masse and began delivering a volley of attacks. One after another attacked, and another, and another. Becoming overwhelmed, the Ghastling couldn't dodge the attacks and began taking hit after hit. It was sure that the battle was over. The Endermen made way for a single final blow. The Ghastling moved its arm to block, then something strange happened. It was as if the hit was a mere nudge. As the Ghastling looked it noticed that a piece of skin from the recently destroyed Enderman was stretched across its arm. With sudden realization, and a slight grin, the Ghastling muttered it first words in a gravelly voice, "Ender beats Ender." Now having renewed faith in victory, the Ghastling pushed off it assailant and leapt to the nearest carcass of a slain Enderman. Stretched a piece of it over his chest and kept moving at great speed. The Endermen, seeing their brethren mutilated by this abomination, became enraged! At once they re-initiated the onslaught with teleportation ambushes and melee attacks of their own. As it dodged assaults, took hits and delivered attacks of it's own, the Ghastling continued to don the skin of its fallen foes. The Endermen reeled to attack as a group then suddenly the Ghastling disappeared in a cloud of purple dust-like particles. Confused, they searched for it not knowing where it went or how it got there. After a moment, a distant laugh was heard, at first quietly, then louder and louder. Looking in the direction of the laughter, they spotted the Ghastling atop one of the obsidian pillars that adorn the island on which they reside. 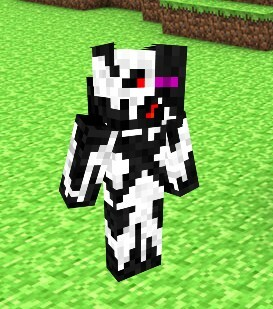 It was even more grotesque, wearing a piece of an Enderman's face as a partial mask. It shot a single fire ball at the crowd of Endermen before vanishing once again. This time it was standing on the edge of the well where the Dragons egg rested. With a solemn but sinister "Goodbye" the Ghastling leapt through the portal. Sunlight begins to light up the east horizon a day breaks. Zombies and Skeletons frantically search for a place to hide from the suns rays. Some make it, some don't. The Endermen all go below ground as the cows, sheep, pigs, and chickens start to wake. Suddenly there is a heavy wind. It doesn’t seem to be blowing in any given direction. The animals scatter as they sense something terrifying about to take place. The wind finally begins to find an origin as a rift opens just a few meters above the ground. A strange being falls from this circular disc and lands in a crouch. The rift then closes. The Ghastling squints as it looks to the bright horizon. This place is unfamiliar to him. Quickly surveying it’s surroundings, it teleports to the tallest tree in the area to get a better view of any threats that might be headed towards him. To his surprise, nothing is. There doesn’t seem to be anything in the area. Teleporting down, the Ghastling begins to walk. No direction in mind, just going, moving. This place is nice, but it just doesn’t feel right. Something keeps calling from the south. It’s almost like a whisper. The Ghastling unconsciously follows it, not knowing where exactly he’s headed. He the whisper grows all day as the Ghastling walks. As night begins to fall the whisper has now grown to a low roar. To anyone else this would be unsettling, but it almost seems familiar to the Ghastling. Running now, he tries to yell back, but there’s no response other than the call that has been nagging at him all day. Seeing something in the distance, he teleports as far as he can until he’s there. Now standing in front of this glowing doorway, the call drowns out everything else around the Ghastling. He slowly steps inside not knowing what, he’ll find. Everything is drowned in a purple light, then in the blink of an eye the landscape reappears, but it’s different. Nothing like before. It’s so comforting even more so than the bright blue sky and the green grass on the other side of the doorway. A loud screech comes from behind him. As the Ghastling turns around, he sees a giant mass in the sky, very similar to himself. It is coming his way, then without warning, fires a shot at him, missing and hitting the doorway, closing the portal and trapping the Ghastling in the Nether….. Seeing his only means of escape disabled, the Ghastling leaps to dodge the next attack. He shoots a few volleys of his own fire charges, to no avail. This Ghast is relentless and keeps attacking. The Ghastling keeps dodging attacks and as he does, he yells, What *blast* is *blast your *blast* DEAL!?!?! Upon yelling this the Ghastling shoots a volley of fireballs then teleports to a ledge closer to the Ghast. He fires another, teleports, another blast, teleport. He is everywhere at once and the Ghast cannot hold up. It slowly drifts down to the ground and lands, just next to a lava pit. The Ghastling teleports near the fallen Ghast. “I will be back for answers one day” said the Ghastling, “and when I return, you better watch it. Cause I won’t hold back next time you decide to use me as target practice.” He steps through the Portal and after a few seconds sees the beautiful landscape that he left. Added Episode 3. It's a bit short....sorry bout that. Next update will have more story to it. If you like the skin, please share it with your friends. The more diamonds, the better!